This is an everyday pasta that is easy to make and very tasty by itself or as a side dish to roasted meats. Substitute egg noodles or rotini for variety. Spicy or hearty greens like watercress or wilted chard and kale are also very good. In a large saucepan of boiling salted water, cook pasta until al dente. Meanwhile, in a large deep skillet over medium high heat, sauté bacon until crisp, about 5 minutes. Drain off excess bacon fat. Lower heat to medium, add olive oil, garlic and chilies, stir and cook for 1 minute. Remove from heat. 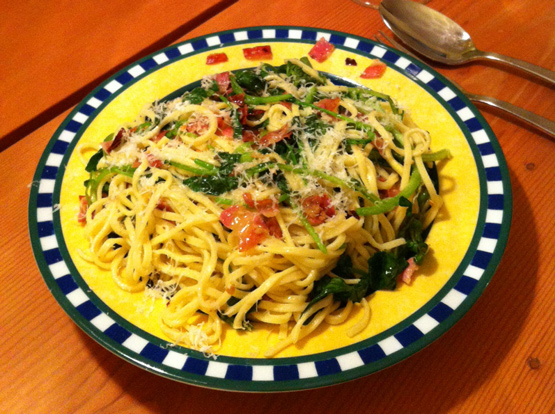 When pasta is cooked, strain and transfer pasta to the skillet containing the bacon mixture. Add arugula and about half of the grated cheese and toss until greens are just wilted and evenly mixed with pasta. Season with salt and pepper to taste. Transfer to large pasta bowl and sprinkle with the rest of the parmesan cheese. Drizzle with more olive oil if desired, and serve, family-style.